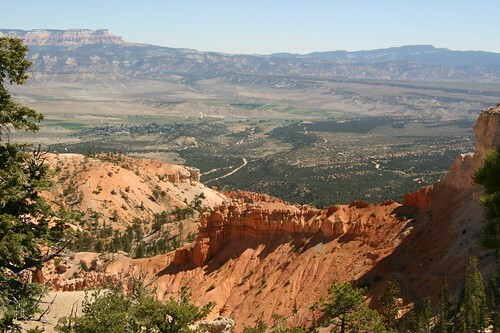 If you’re looking for an ATV adventure in Bryce Canyon, look no further than the Paunsaugunt ATV trail. Now obviously there are no motorized vehicles or ATV’s of any kind that can use the actual trails within Bryce Canyon, there are some fantastic trails that have been specifically developed and maintained for riders outside of the park. They offer at times great views of the red rock hoodoos of Bryce and views of the Paunsaugunt as well. They make for some of the best ATV riding in all of southern Utah. One of our favorite trails is called the Pansaugunt ATV Trail that is part of the Powell Ranger District of the Dixie National Forest. It’s a long trail so there are multiple trailheads that you can utilize to get onto it. On the north side of nearby Tropic Reservoir there’s an access point to this trail. There’s another access point from the Crawford Pass trailhead. If you’re looking for the southern trailhead then Straight Canyon is where you need to get. Bryce Canyon atv trails like this one simply make for an even better trip. The trail offers views of the Pink Cliffs of the Grand Staircase-Escalante National Monument as you ride along and through the Kaibab Plateau. The trail itself can be anywhere from 20 – 75 miles in length depending on how much of it you’d like to tackle. What you’ll find along the way is a well maintained trail that will come around the bend and offer you spectacular views of the surrounding area. It’s sometimes nice to combine the beauty of Bryce with the excitement of riding an ATV. The two contrasting activities make for a wonderful adventure when you come to visit the canyon. ATV trails in Bryce like the Paunsaugunt trail make for a memorable trip that offers both excitement and vast views all around you. Don’t miss out on an ATV ride here that’s for certain. Tree’s in Bryce Canyon Should You go to Bryce Canyon or Zion Canyon?